We've talked recently about the different ways you can identify new customers once your book is finish, and one common theme across these approaches is email. No matter how you get in front of people, at some point it probably involves sending them a message. In today’s show we look at 2 ways you can make the most of the messages you send; your Super Signature, and following up with a SPEAR email to move the conversation forward. No matter what business you're in, the aim of your book is to start a conversation with a potential customer, and your emails are the best way to develop the relationship while giving people the opportunity to move to the next stage. To take that minimum viable commitment step toward doing business with you. There are some great ideas in this show, things you can implement today, and you can grab a copy of the Email Mastery book from EmailMastery.com to up your email game even further. 1. Be a guest on "More Cheese. Less Whiskers." My favorite thing to do is hatch evil schemes and apply the 8 profit activators to all kinds of businesses. Big businesses, small businesses, professional services - Click Here. The framework of everything we talk about on More Cheese, Less Whiskers is based on the 8 Profit Activators. Find out how they are either growing or slowing your business - Click Here. I'm putting together a new email case study group at Email Mastery this month... stay tuned for details. If you'd like to work with me on your email sales process... just reply to this message and put "Email Mastery" in the subject line. If you'd like to work directly with me to hatch some Evil Schemes for your business... just reply to this message and put "One-on-One" in the subject line... tell me a little about your business and what you'd like to work on together, and I'll get you all the details! Questions about your book? Just hit reply and we can schedule a quick call to answer any questions. Stuart: Hey, everyone. Welcome to another episode of the Book More Show. It's Stuart Bell here with Betsey Vaughn. Betsey, how's it going across there? Betsey: Super, Stuart. How are you? Stuart: I am very good. Although, ironically, just before we start recording, I was noticing today the building next door to the office here is having some renovations done. It had been pretty quiet. And 20 seconds into the recording, they're banging again next door. Stuart: So, we might get to the end of this great show, and then I'll listen back, and it will be unusable because of the noise in the background. But, hopefully, if you're listening to this, it wasn't too bad. Stuart: I was recording The Focused last week and had to do a bit of editing around in the middle of the show because in the middle, this god-awful, it almost sounded like something was in the walls and trying to get out. But it was quiet enough, so I wasn't quite sure where it was coming from. But it worked out a couple of seconds in it was some drilling going on next door. But that took a little bit of editing. I was like, "Well, hopefully that wasn't too disrupted of last week's show," before listening back. Betsey: Oh my gosh. That's great. Stuart: Okay. So, today, we are going to follow up on a show from a couple of weeks ago, where we were looking at some of the immediate steps you can take once you've got your book completed. So, we've got a fair few questions come in as feedback and just comments. And then in the calls I think both of us have had, but definitely ones I've had over the last couple of weeks, this issue or people asking questions to go deeper into this issue has come up quite a lot. So, I think it's worth diving into a little bit kind of the immediate things that you should do or could do once the book's complete to really get it out there and get using. So, how does that sound? Betsey: I think it's great. I think this has been such valuable information, and I'm not going to say it at the end of this call, I don't think, but, again, I've had some feedback from some people who've been listening and the things that they're getting from it. That's the biggest thing: People know what they want to do, and what they want to write, and what they want to say. And then they just don't ... And not even just about a book, Stuart, it's about just in general reaching out to people. You know? Betsey: They're just struggling with that, what is the best way to market themselves, or their business, or their book, or their program. Whatever it is, I think people are really just ... I think sometimes they think it's the same old, same old. And they need fresher ideas. And so I think this information that we've putting out has been ... The positive feedback we're getting has been great. People are listening to it; their excited about it. So, I don't think we could ever stop talking about this, to be honest with you, because we just hear it all the time. Stuart: Every day there's one born that hasn't seen the Flintstones or whatever the case. You can never cover the basics too much. Stuart: Okay, so being said that, let's dive into the super signature because this is something that's come up in two or three of the conversations I've had recently, as I mentioned. And super signature is something that people aren't necessarily familiar with. A lot of people listening now will also be listeners to the More Cheese, Less Whiskers Podcast, and they're familiar with their Breakthrough Blueprint or Breakthrough DNA Framework that we have. And that's a kind of a core tenet in those conversations. But if you're not coming from that space, if that's not something that you're familiar with, then the idea of a super signature is something a little bit alien or that you don't have the familiarity with. So as you're listening to this, if it's something that you're not familiar with, then check out the emails we send out with the podcast, or the follow-up email sequence that we've got after the initial opt-ins. What you'll notice is that super signature is saying here are a few ways that we can help you as soon as you're ready. So this super signature that goes with every email or every email of this type, the aim of it is to give people options to progress the conversation, to take their understanding further, to take their thinking further. So your book, as it's introducing or going deeper into a particular concept, whether that's just your own concept, your own unique idea, or whether you're elaborating on someone else's ideas or common knowledge that's out there already, the thing that we're looking to do every stage is engage a reader in a conversation so that we can progress their understanding, their learning to take their knowledge to the next level to help them more and ultimately to let them become customers. I'm going to try to do it again because there's a way with an angle grinder outside cutting metal. Betsey: Yeah. I heard it. Stuart: I'm hoping that they can't, so while we're on the air, we're like 6:30 at night here in the UK as I'm recording this. I'd said to Betsey early in the day, "Don't worry. It's approaching 5:00" now earlier on when we were scheduling. "It'll be fine. They'll have finished." So I'm hoping that they can't carry on for that much longer. So we'll just power through. Betsey: Here in the U.S., at 5:00 they'd be finished for sure. Stuart: They put in a full day. Betsey: Yeah. Somebody's getting their money's worth. Stuart: Yeah. So the whole purpose of the book is to identify those invisible prospects to get the conversation going. And then the whole purpose in the follow-on sequence is to get someone into conversation and actually get them on the phone, because at the end of the day, in everything that we talk about, we're not talking about some huge scale thing where we're looking at attracting millions of people and then having follow-up sequence there or automated because you can't deal with the volumes. Realistically what we're talking about is engaging thousands of people, low thousands of people really, particularly if you're talking about a local business where you're looking at people within a specific geographic area. We're really engaging thousands of people because that's realistically the size of the pool you're fishing in. Of those, it might be the low hundreds who are ready to even think about a conversation at the moment. The rest of them just either were not interested to begin with or they're just not ready at this moment. And then of those low hundreds that might engage with some further emails, we're really talking about the low tens of people who at this moment in time are really just ready to have the conversation. And that volume, when you think about it, if from those low tens you're able to convert a small handful of those into customers, but you're able to that month in and month out, then that, for the majority of people, is a nice, sustainable business because we're not talking about high-volume business. We're not talking about kind of upsales where really you're talking about some advertising revenue or a couple of dollars per hour when you need to sell tens or hundreds of thousands to make a difference. We're talking about real business in real times or real coaches online, where the numbers don't have to be huge because it's that more ongoing kind of value relationship with people. So the super signature is the thing that in each email gives people the opportunity to self-identify and take their understanding, take their journey further by offering another thing. Makes sense? Betsey: Yeah. It does make sense. And the funny thing is, I don't know if he'll listen to this or not, but he might, so Dean, he talks about the super signature a lot, and obviously we send out a lot of emails. Dean does. We do. And I don't always read the super signature, to be honest with you. But today, and I didn't even realize we were going to talk about this today, but I found myself in an email this morning going through and actually reading the super signature to see what all information was there. And there's really just a lot of valuable, people probably see it day in and day out even from us every few days or our emails and stuff. But I think at some point, somebody goes, "Aha, that book thing, or that email mastery, or what ..." something, "I want to do that." Stuart: Absolutely. And that's the key because exactly as you said, the super signature and emails in general kind of communication points in general, unless the person's ready, unless the recipient was ready, they're not going to see it. It's not going to register, it's going to flash by in the background. But when they are ready, they're most likely to see it because every opportunity or every relative opportunity, you're putting it in front of them. So it's this whole concept of if you're building and churning email leads, when you're kiting leads, you're sending people one communication. So, take a book, for example. Someone opts in for a copy of your book. You send it to them and then never do anything else. The hope is that they were moved enough to take an action at that moment in time. But reality is that's not the way that most people operate because even the ones who are pretty engaged, it's only the hottest that are going to act now. Even the ones that are pretty engaged, they might forget about it because two days go by and something else happens. So by regularly communicating to people, and this is why we talk about the flagship broadcast afterwards, and actually you talked about email mastery. Everything that we're talking about here is exactly the model that we use across all of the business units and the super signatures. The concept is absolutely Dean's idea. So I'm not trying to misrepresent that as a 90-Minute Book idea. This is ... Well, apart from Dean is the name in the book as well. And Email Mastery, I would recommend as people are listening to this, head over to emailmastery.com and grab a copy of the Email Mastery book because it talks about several other email techniques that you can use, this being one of them, to up your email game and make our process more engaging and then more likely to convert. So I'll stick a link in the show notes, but definitely head over to emailmastery.com and grab a copy of that book for even more email goodness than we're talking about now. Stuart: ... why or think about the context in which it's used. So from a super signature, we use that in every broadcast, in most broadcasts. I think there was an exception that proves the rule. We use it in every broadcast that goes out that is clearly a non-personal email, so like a group email, so the podcast broadcasts that go out have a super signature on. Some of the follow-ups to the opt-in sequences flip at a certain point and start to have a super signature on. The ones that we don't include a super signature on are the ones that we call the SPEAR emails, the short, personal, expecting a reply emails. Like when you first stopped on to get a copy of the book, all we've got there is, "Here's a copy of the book. It's a great read. Thanks. Stuart," or, "Thanks. Dean." The nine-word emails that we send out every month or so saying, "Hey, Betsey, do you want to get started on your book this month?" we don't put a super signature on that because those emails, the ones that we're aiming or the purposes that they look personal, that they are personal, they're talking to that one person even if it's broadcast to a larger group of people, those emails, the perception around them, the way they're positioned is different from the broadcast ones. So, again, super signature, fantastic thing to have; it doesn't necessarily mean that it needs to be on absolutely everything. Stuart: It's like salt and pepper. It probably should be put in a lot of food, but you wouldn't just necessarily dump it on everything without considering it first, or hot sauce. Stuart: I'm not a fan of hot sauce. Betsey: ... unless you're from the South, and then we just put salt and pepper on everything all the time. Stuart: I was just going to come up with the same kind of caveat. Hot sauce, I'm not a fan of hot sauce, but the kids seem to stick it on stuff before even tasting it. Betsey: Oh, everything. Ketchup on everything. Yeah, exactly. Stuart: So we've talked about what the super signature is and it’s kind of ... what the theory of it is. So let's look at the specifics of what it is because, again, this trips people up. So the aim that we're trying to do is give people relevant options to take the conversation further, to take their understanding further, and if relevant, to take the first step. So like with the back of the copy of the book, quite often we'll talk about think about putting three steps on the back of the copy, a kind of a zero commitment step, where people can find out more; a medium level of commitment, where without saying, "Get started now," or, "Pay me some money now," they can raise their hands so they can be identified as hotter prospects. And then the third level if you're ready to get started, here's the easy way to get started today, the kind of offer type thing that we talk about sometimes. So those three steps cover the people who are interested but not particularly warm. So go here and find out more. That's just to kind of help them enhance their learning to discover more, to increase their understanding, and hopefully leading on to their understanding of why it makes sense to work with you. The middle option is here's a step that requires a commitment, and that commitment is probably just give me your name and email address, or here's the flag in here somewhere that will identify you as being hotter. It might be fill in this form or this assessment. Just kind of take the journey to the next step to start that process towards becoming a customer. And then the third one obviously you get started. So with the super signature, you can do the same thing. Now, it might be the case that you should include the book in the super signature. So depending on how you attract leads, obviously if it's all of your lead generation is through people requesting a copy of the book, then that doesn't make so much sense because you can safely assume that everyone on the list already has a copy of the book. So like for the majority of, the large majority of our lead generation work is done through the various books that we have. So it's a pretty safe bet that anyone that we are emailing with already has a copy of the books, so we don't typically include that. If we were running a website, whether it was a lot of organic traffic, if we were buying leads from elsewhere, if we were working with other organizations and sending emails out, if we did a lot of seminar-type traffic where people were lead generating at a seminar where we don't necessarily have the name and email address of people, then the first step saying, "Here are three ways we can help you today. Number one, grab a copy of the book. Here are the books that we wrote about such and such subject. Grab a free copy of it here," and direct people to the landing page. You've already got their email address because you're emailing them. So you're not too bothered about the lead generation piece, but what it does is identify them as hotter prospects. It's a way of from all of the crowd of people that you're emailing, if they're in that group of not being on that particular funnel already, then it identifies them as joining the top of that funnel. And it could be the case that you've got one webpage out there, like, there might've been a Book.com that's the download for the book. But then you might direct people to a completely different landing page specifically for this link. So the email link, you might send people to the nameofthebook.com/emaillink, and the form on that page flanks them separately. There's various ways of being able to flag and tag people so that you've got more of an idea where they're coming from. And the reason that you want to do that is that you can tailor their journey afterwards. So perhaps then it's in this particular example, it was talking about you already know who they are because you're in email conversation with them already. You've put the book on area in opt-in because these people are on in this particular channel. Flagging them is the same way, might put them in an auto-responder sequence that's different from just the very cold traffic that comes into the regular book landing page. So let's think of an example to back that up. We've used ... For some reason we keep going back to florists as the example. So let's stick with that. So we might have a newsletter-based mailing list from the store. So we ask people to opt in when they come into the store or when they've been customers in the past because we one-off them discount coupons, or the latest news, or the latest styles. We send out this newsletter. So that's a generic list of people. We've got their email addresses, but we don't necessarily know much more about them. In the florist example, if we had go, sticking with the book that we talked about in terms of wedding flowers, so what do we have a few weeks ago is kind of like the main guide to autumn wedding flowers, or something like that. Betsey: Yeah. Like that, yeah. Stuart: So that is a very specific group of people. So if we've got a big list of everyone, identifying people who would be interested in that service, having a super signature that offers that book, maybe in this context we add a little bit more to the text, saying, "If you're planning a wedding or know anyone that is, head over to this page to grab a free copy of the book. Please feel free to share it with as many people as possible so it might spread wider." But when they go follow that link through to that landing page, the autoresponder sequence that then kicks off is specific to that funnel. It's specific about the wedding venues, and wedding flowers, and the seasonal differences in this particular part of the country, and tailoring that conversation, guiding them towards the outcome. You want them to do this particular thing. So it might be come into the store for a monthly workshop that you've got or a presentation on how to choose the best flowers for your wedding that seasonally varies throughout the year. Let's say that's the outcome because you know that when you've got people in the room, you can convert 10% of them, 20% of them into buy-and-go service because they're there. So the step before that is inviting them to the free workshop. The step before that is identifying that they're interested separate from the rest of the list. So that's the first thing in a super signature. We don't typically include the book because most of our traffic already has gone through a book channel. But as you're listening to this, that might be a super valuable thing to do, particularly where you've got lists that are I don't want to say big particularly, but substantial lists depending on the, or relevant to the size of your business, a big list that maybe you haven't big particularly engaging with before, first thing might be to add this on the list. The second thing might be to include the workshop details. So all guides, I'm thinking of things that fall into this second category, this middle category of people identifying themselves as more interested, but not necessarily, "I'm going to commit to commit to part with any money." So it might be the workshop sign-up for next workshop or come to our next workshop. It might be a guide or an assessment or something that people can fill in. The aim of this fill-in step, this middle step, is really that people can evidence to themselves that they're making the right decision, that they were on the right path. So we have the Book Blueprint Scorecard. It's a scorecard that people can fill in some boxes, put numbers, can assess themselves on their competency, their completeness, their kind of overall thinking on creating a book specifically in a business context. So for us, we got in a lot of the funnels. We've got the Book Blueprint Scorecard as the second step. On the coaching side of the business, we've got the Profit Activators score scorecard as the second step. So I'll stop talking in a second, see if I can find the text on that particular email. But that middle step, that second step in the super signature is really just to amplify the message they're already putting out there and let people take that next step. So for a financial advisor, you might have some onboarding questionnaires or a guide, a checklist or a scorecard where people can score themselves. We've done a lot of work. We mentioned Jim Hacking in the past a couple of times and the innovation stuff that Jim does. Their book, bring your spouse here about spouse and fiancé visas, they have a checklist because there's a lot of documentation involved in that process. So they've got a checklist that people can fill in there. Stuart: I need to take a breath. Betsey: I know we see a lot of assessments, like you said, with some of the guys like the financial people or maybe attorneys or something, but I'm thinking on the scale of like Joe Local, the local florist that's doing something. So would you say that they put that link there ... Maybe it's they need to figure out maybe it's what their budget is. Maybe they need to figure out what their wants are, and they fill that whole assessment. I mean, is that what you're thinking, they would put some sort of assessment there that would go back to these people? And, again, I get it with some of these big guys, bigger guys that we've worked with or financial guys that might have a larger, obvious, already set client list, or inactive or active list. But somebody like a local guy, same thing. I think that ... Hey. Stuart: We've got all the noises today. Stuart: Yeah. That's actually a good point. I've only got so a few more weeks of UK sirens, and then I can replace them with US sirens. Stuart: I know what you mean. And I think as with all of these things, I think in one of the earlier podcasts that we did, we talked about strategy versus tactics. And the strategy is the high level, "Okay, I know that I want to take someone from A to Z, and it's there's 26 steps in between those. It's not just A to Z in one step. It's that's the strategy. The strategy is moving people, this minimum viable commitment thing of stage by stage by stage, taking people further down the path, revealing the next step to them as them at the next step rather than jumping too far too fast. The dating analogy, we've used that a few times. You don't kind of walk into a bar, say, "Hey, nice to meet you. Do you want to jump into bed?" There's a getting to know you stage that's involved there. So that's the strategy. The tactic is then the individual thing that you do, and that's absolutely going to vary by exactly some of the things that you say, the nature of the business, the scale of the business, your individual capacity and capability and preference--all those things are going to vary. So I think for it's easy to think about, talk about an assessment and say with a financial guide it's easy to think about because it's all numbers based or with Jim and the immigration stuff is very checklist-based, so that's easy. But that's specific to their business. So I think with the florist example, it might be something like a checklist there very easily springs to mind, so something like, and again this is where the analogy breaks down, because it is not a strength, a core competency. But, yeah, I would imagine it's something like, "Okay, have you chosen the venue? Do you know what the average temperature is going to be like? What time of year is it? How many flowers do you need? What's the size of the venue? What's the number of tables? Is there some kind of calculation that says, "Okay, based on the number of tables, you need to pick 10 stems per table, multiply that by the number of tables, then add an additional $10 per bouquet for greenery and stuff around it? And that will give you your budget." So it might be something like that. These assessments don't and in fact shouldn't be something that someone fills in and it goes to you, and then you've got to kind of assess it and give some indication. The only way it works really is that they fill the details in, and then the thing that they get back has some generalized, but as useful as possible advice. For something that's more a higher volume, so like stick with the florist example, it could be that, again, the analogy is going to break down because it's not in my ... I need to make an example I know something a little bit more about. Stuart: Yeah. Well, actually, I could ... Yeah, let's jump ... So, the Book Blueprint Scorecard does exactly this: We've got eight, nine sets, which we've talked about our length in the last few shows. Each of those mindsets has four stages. When you complete that scorecard, the answers that you get back, the advice that you give back, is great things to focus on, but it's relatively generalized. So we say something along the lines of what we typically see is people scoring in one of three ways: Either they're low across the board, they're somewhere in the middle, or they're high across the board. So for if you scored low across the board that typically means that maybe this isn't something you've thought about. You know that this is something that you should do, but you haven't spent a lot of time and attention yet. So by taking a look at the scorecard and the level four, the highest stage of each of the mindsets, that gives you a very good indication of what you should be aiming for and the level of attention that you should be pointing to each of the mindsets. If you score somewhere in the middle, this is what happens to the majority of people. Most people will come to us, and they spend a lot of time and attention in two or three of the areas that they're very comfortable with, but then haven't thought about the other areas either because it's something that they haven't been aware of or it's something that they just haven't got the expertise to dive into. So one of the late mindset #8 is the Beyond the Book: The Follow-up Sequence. Particularly people are very weak in that because of exactly this conversation. It's not something that they think about. So our advice to people who are in the middle is don't spend time on areas where you score highly. If you're confident you score highly, that's it--it's done. Tick that box and move on. Look at the areas where you score particularly low. Try and get that to your middling score so at least you've covered it, and then get it out of the door. Get it down, and then kind of react and pivot and improve and feedback on the late situation. The main thing that you can do is have the confidence to get out of the door and know that you've done enough in the other mindsets so that it's worthwhile, so you're not throwing away your efforts. But don't take another three years trying to get everything up to a super high score. The third mindset, so the third stage, we sometimes see people scoring super high across all of them. Typically this means that people are being, I can't remember what the exact words are, but typically this means something like they're being overconfident. And the only thing to be careful of there is that you're not having too much of an internal view of it. So if you've scored high across the board, that probably means you've spent a lot of time and attention on each of them, which is fantastic. But if you haven't yet, get an outside view on it. Get a second opinion of someone whose business adjacent who knows what you're talking about but who isn't in the business too deeply, because you may be able to find, just before you pull the trigger, you may be able to find a couple of things where you can just tweak the dials a little bit and then get a real extra bang for your buck as it gets out there. So that response is specifically useful information, but generic enough and useful enough that it will give value to anyone that fills in the scorecard without us having to manually review each of them and try and craft an individual message. So I think that's the opportunity for everyone whether you're a local business or part of a big multi-national with checklists and assessments there already. I think that word "assessment" can seem a little bit daunting. But that thing of allowing people to ... Because that whole ... Scorecards is a great example because it's just a nice framework for the majority of businesses, where here's a 8x4 table dropping the things that you know that make sense, and there's a nice way of assessing themselves because really the job of work of that assessment is for people to evidence to themselves that they should progress and do the next thing. It's not that we're trying to convince people to work with us. It's that we're trying to allow them to evidence to themselves that either, "I'm on the right track. I should just pull the trigger and get out the door," or, "Actually, there's a lot of gaps here. How am I going to close those gaps? Well, I can either spend a lot of time doing it myself, or I can ask these guys, who seem to know what they're doing. We're all talking on right page, and they've given me some helpful information already." So that step is really the people evidencing to themselves that they're on the right path and therefore moving to the next step, which is to do business with us, to do business with you. Make sense? Betsey: Yeah, it does. Absolutely. Okay. Stuart: Yeah, well, it can be two things. I'm just going to wrap up super signature because I've got in front of me, everyone that's listening to this will have received the email that ... or should have received the email that were broadcast out with it. So our super signature is in my email message. So go take a listen to that. If you're listening to this and you just subscribed to the podcast, if you're not on any of our mailing lists, then head over to 90minutebooks.com and stick in your details there to get a copy of The 90-Minute Book. And then you'll get the emails that we're talking about as well. So it's a great example of using this in practice. And everything that we do, I mean, we're not precious about it at all. It's still the things that we're talking about here in terms of the super signatures and the nine-word email we'll talk about in a second. And just tailor it to your business. I mean, the more people that start to do this, the better. I mentioned emailmastery.com as a resource to get a copy of the Email Mastery book, so absolutely grab a copy of that as well because Dean in that book goes into a lot more detail than on a number of different subjects, not just the super signature. Just before we move on, then, so I'm going to read the super signature that goes to the entrepreneur list. So that's anyone that's on the Email Mastery list or Breakthrough DNA or some of the other ones that I can't remember now. But it's so the emails that go out from there with the super signature says as the body of the email, and then the sign-off, and then it says "Plus whenever you're ready, here are four ways I can help you out. Evil schemes for your business. Number one: Be a guest on More Cheese, Less Whiskers." My favorite thing is to hatch evil schemes and apply the eight profit activators to all kinds of businesses, big business, small business, professional service. Click here to be a guest on the show. Number two: Try the new Profit Activator scorecard. The framework of everything we talk about on More Cheese, Less Whiskers is based on the eight profit activators. Find out how they're either growing or slowing your business by clicking here. Number three: Join our Email Mastery Academy and become a case study. I'm putting together the Email Mastery Group at the end of the month, searching for details. If you'd like to work with me on your email sales process, just reply to this message. Put "Email Mastery" in the subject, and I'll get you all your details. And then #4, work with me one on one. If you'd like to work directly with me to hatch some evil schemes for your business, just reply to this message and put "one on one" in the subject line. Tell me a little bit about you, a ... I keep tripping over my words. Tell me a little bit about your business and what you'd like to work on together, and I'll get you all the details. So those four things, then, are exactly as we described. There's the initial no-commitment stack of being a guest on the podcast. There's the middle one of the Profit Activator score card. Head over and fill out the details to evidence to yourself, where you see it on that framework. And then three and four are really the main customer-driven things of joining my mastery or work with me one on one. So that example, again, is another one, there. As you're listening, you can steal those ideas and tailor them for your own business. And at every email communication, it's an opportunity to them for people to take it for themselves. Betsey: So the nine-word email. Stuart: Nine-word, yeah. So the nine-word email, again, this is another Dean Jackson idea. Dean switched to do the nine-word email for, I mean, this idea goes back years now we've been using it hugely successfully across all sorts of businesses, particularly anyone that's got a list of over even 500 people that maybe they haven't been communicating with. The nine-word email is what we refer to as a SPEAR email, short, personal, expecting a reply. It's not a cold traffic email, it's designed to reengage leads that perhaps you haven't spoken to for a while, or people who are on the list then get a short personal email that kind of is separate from the normal email blast that people would typically see. Nine words, there's no magic in nine words, but a nine-word email is shorter than a 29-word email. So the idea is that it's short, asking one question. Betsey: Sometimes you might get an 11-word email from Dean. You might get an eight-word, even. Just sometimes it happens. It does. Stuart: And it's funny how many people reply and say, "Oh, that's not nine words." Betsey: They do. It happens pretty much once a week. Betsey: You know what? But there's ... I think if people would just walk away with nothing after listening to this today is the nine-word email--it works. It engages people. It is short. It's a simple question, and it makes people want to respond. They feel like it is a personal email. They feel like they're friend ... I mean, and somebody said this to me two days ago: "I felt like my friend Dean that I don't even know sent me an email." And that led to a conversation with me, and then it led to them coming onboard to do a book. And that's the goal, to have that conversation, to just a blanket statement, nobody's doing anything. So you ask that question, that simple question, that one question, and make it like it, "Hey, Stuart, would you like to get started on your book this month? Dean." And people feel like, "Wow, that's ..." It's simple. It engages you, and it doesn't have to be, like you said, 29 words or even less. Stuart: Yeah. And I think as people listen to this, definitely go and get a copy of the Email Mastery book because the nine-word is the, I think it's the first chapter now, but it definitely goes a lot deeper than we'll have time to explore. But that personal element and the SPEAR, the Short, Personal, Expecting A Reply, that's exactly what it is, and it's exactly why it stands out from the kind of corporatized type blurb email that people are typically expecting to receive. Betsey: This is probably like who I was before I came to this organization. Stuart: Right. It's almost like people feel like they've got to talk more. It's like that Ross thing, you'll kind of always be closing. And if people are still talking, then I'm still closing. So the people on the list try to translate that into email, and they've got a B submission by putting in all of the words. It's like the long-form sales letter squashed into a landing page with all of the information in there rather than thinking about it as this is the beginning of the conversation. So from the book perspective, as you're listening to this, you're either thinking about writing a book, you have written a book. You're coming to the end of the process of having written it with us. What's the first thing that you can do as you're thinking about putting it out there? If you've got any size list at all, whether you're regularly communicating with them or you haven't communicated with them for a while, one of the best things that you can do, because you know the book is great for generating leads, but these are the leads we've already got. It's people you already know; you've had some kind of conversation with even if it's a long time ago. So asking them are they ready to do such and such, so with Phil's example, "Are you still looking to buy a yacht?" With our example, "Are you ready to get started with your book this month?" With the florist example, "Have you booked a venue yet? Are you still looking for wedding flowers? Have you decided on the type of flower?" although not those words--better words than that. With the financial advisors, "Have you picked an IRA yet? Have you sorted out your pension yet?" all of these things that are short, personal, expecting a reply. Almost the book is irrelevant because we're not really generating with brand new people. We're not offering them something. But the book then comes into play as a follow-up. So it's an opportunity to once people reply to engage in a conversation. But if that starts to go dry and they're not ready yet, send them the email saying, "That's great, but here's a copy of the book if you want to find out more information." The florist example, if someone doesn't reply, you send the one email already kind of trying to reengage through conversation, sending a follow-up short email afterwards, saying, "Hey, Betsey, I've just written this book that talks specifically about this thing that we were talking about, that talks specifically about flowers in the fall in Maine. Go grab a copy over here." The short personal one is the way to kind of reengage that list of people with a short personal question that encourages them. It makes it simple for them to reply and really just starts that conversation. Betsey: Yeah. And we see it all the time, the success we have with it, and we hear from people who ... I think I shared this one time when I was at one of Dean's events and somebody did the nine-word email. And that night they had like an exorbitant amount of email responses that came in from that. Do you remember that? Who was that? It was one of our current clients. And it just worked. Stuart: Yeah. In the London event last year there was ... What was the exact business? They were property managers in Spain. And I can't remember the exact details. They were lead generating through third party, so there's a couple of ... These details aren't going to be exactly right, but they're close enough. So they were lead generating through a couple of big third-party sights like Zillow or Trulia. There was like some big MLS, where people who were interested filled out some details. But then it went through a third-party agent. So there was this disconnect where they were collecting a number, a good number of leads, but there wasn't necessarily an ongoing conversation. Or it went quiet pretty quickly because there was disconnect between the site that the person was initially responding to and then the emails were coming from a different entity, so there wasn't necessarily a coherent relationship going on. So the nine-word email that we sent out there was something like, "Have you bought a property yet?" And the responses to that were off the chart. Now, sometimes people say, "I don't want to send out a nine-word because what if I get too many responses to handle?" Well, that's a good problem to have. All of this is business, potential business that you didn't previously know about. So even if it takes you a week to get three of them, do it, and then you've identified all these people. And even if you follow up with only 15% of them, I mean don't follow up with all of them, but even if it was 50%, it's still a lot more than it was. But that short, personal, expect a reply, it makes it easy for people to get into conversation. It's relevant to whatever the original thing was that they raise their hand, and it's specific enough that they can just reply to that one thing. It's not replying, asking them for their opinion on a big, broad subject, I think. It's just one short, specific question that makes it easy to reply to and therefore easy to start that conversation, that minimum, viable commitment step. Stuart: I think we're probably done. Stuart: It was good. I think there was, as I say, if you're listening and you're thinking, "There was a lot there. I'm not quite sure how this fits in," or, "There was a lot of examples that I'm struggling to get in my head all at once," head over to emailmastery.com, and grab a copy of the Email Mastery book because then obviously it'll take you through step by step a lot of these things that we've talked about. I'm going to put some show notes and a couple of the super signature examples on the show notes page, so that will be as always across on 90minutebooks.com/podcast, or follow the podcast from the resources link on the top of the website. And then this is going to be episode 60, so 060. And then they'll be some of the additional resources there. We mentioned in there the Book Blueprint scorecards where you can position yourself against the eight mindsets of creating the best lead engagement and the best business book out there. 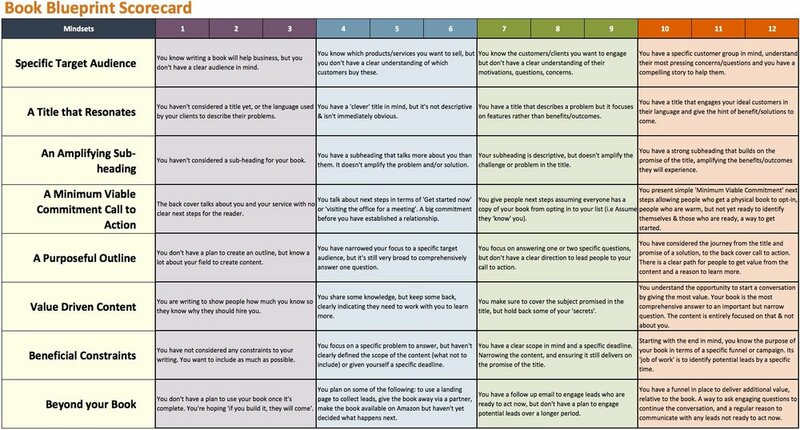 So for that, head across to bookblueprintscore.com, and then you can score yourself against that framework and identify which areas you're strong in, which you could do with more help. And then if you need more help, we can obviously do all of this for you, and make it so that it just takes up 90 minutes of your time and get it out there. And just head across to 90minutebooks.com and follow the Get Started links. And we're here waiting to help and get your book out there. Stuart: So anything that's ... Any last words? Betsey: No. I think it's good, good stuff. And that's all I'm going to say. Betsey: They know. They know the drill. They know. That's the point. Stuart: Okay, guys. Well, thanks for listening. We'll be back next week with another show. In the meantime, head across to 90minutebooks.com, and then follow on some of the resources we talked about. Thanks for your time, Betsey, and we'll catch up on in the next one. Betsey: Always a pleasure. Take care.